Disclosure: I received no compensation for this post. I am just sharing to help animals in need and one of the charities I support. As a rescue kitty myself I want to help other rescue pets find their forever home, so each week on Charity Tuesday I share adoptable cats from Wood Green, the Animals Charity (which is where I was rescued). Mum and I are so grateful to this amazing charity because without them we would never have found each other! Please note however that this post does contain some affiliate links. This means if you click on the Zazzle links to purchase any of the items featured, I will receive a small affiliate commission. Read full disclosure policy here. So not only is it Charity Tuesday today but as you all know it's also Valentine's Day. Many pet lovers will know that there is nothing quite like the unconditional love that exists between you and your pet. So what better way to find true love than to take yourself off to your local animal shelter today. You may just meet the love of your life! Animal shelters everywhere are filled with so many loving, beautiful animals who are all looking for love and a forever home. 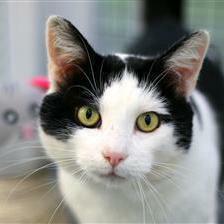 At Wood Green, cats like the very handsome Whittington is waiting to share his life with that special human who will give him the love he deserves. And we're sure he'll give the same back! As you can see from the video below, Whittington is a charming and affectionate cat with so much love to give. He was a stray before he went to Wood Green. Whittington is so cuddly and loves to play. Due to a medical condition he needs a home with a fully enclosed garden and has to be the only cat in the house. He is at the Heydon branch of Wood Green. If you're interested in adopting this sweet boy check out his profile HERE. and mug will be donated to animals in need. Whittington...dude! What a name! Nicknamed Whitt, right? Love and hugs to Athena and Marie! I hope Whittington finds his Valentine soon! Whittington is a handsome boy, I hope he gets his forever home soon.